Jalan Alor is a short walk away from the modern shopper’s paradise of the Bukit Bintang Walk and its many malls and plazas. This is a place burgeoning with activity both during night and day. It is quite an overwhelming experience for the first timers, who may have some difficulty on deciding where to eat. . It's generally filled with mostly tourists because they've read about the "experience" of "hawker food stalls". There is a wide array of food to choose from, some of the best being the grilled fresh seafood. For the atmosphere and the experience, this is as a must-try street culinary for first-time visitors to KL. The food is great at an average price. It is not cheap but it is not that expensive. They are selling Durian. It smells odd, but it tastes different. Please don't do this if you have been drinking a beer. it could be one of your worst days. It’s easiest to arrive at the Bukit Bintang monorail stop and walk along Bukit Bintang. When you're about the KFC you have to go left and than you have to walk 20 meters and turn to the left. Jalan Alor is a street full of Malaysian authentic food like curry laksa, assam laksa etc. It should be an amazing scene for trying Malaysian local foods. Bukit Bintang is the shopping district and entertainment zone with big malls, many shops, lots of bars and pubs as well. This area has a pretty good number of hotels which ranges from 150 RM and above (depends on your choice of luxury). It is popular among tourists and locals, especially among the youths. A part of Bintang Walk is designated as an "Arab Street". Bukit Bintang or Starhill encompasses Jalan Bukit Bintang and its immediate surrounding areas. The area has long been Kuala Lumpur's most prominent retail belt that is home to many landmark shopping centres, al-fresco cafés, swanky bars, night markets, as well as hawker-type eateries. Nestled within Kuala Lumpur's Golden Triangle, the Bukit Bintang district begins with Jalan Bukit Bintang which starts at Jalan Raja Chulan and ends at Pudu Road. The two other roads that border the Bukit Bintang district are Jalan Sultan Ismail which intersects it and Imbi Road at the south. Jalan Walter Grenier, Jalan Bulan, Changkat Bukit Bintang and Jalan Alor are considered part of the entertainment district. Berjaya Times Square It is currently the 13th biggest shopping mall in the world boasting 12 levels of retail with a total of 3,500,000 square feet (330,000 m2). Although it was initially aimed at the upper-echelon of society, it is currently positioned as a middle-class shopping mall offering youth fashion targeted at the younger crowds. Starhill Gallery is probably the ritziest and luxurious mall in the whole of Kuala Lumpur alongside Suria KLCC. A Louis Vuitton flagship outlet flank the exterior facade of this grand structure. Fashion houses whether Gucci, Fendi, Valentino can all be found here. Pavilion KL Built in late 2007, it is targeted at the middle-upper segment of society. It offers a diverse tenant mix which makes it one of the most successful malls in KL. Tangs and Parkson are the anchor tenants of this mammoth 7-storey retail podium, first-times in Malaysia like Mandarina Duck and Juicy Couture have settled here. You'll also find a plethora of luxury boutiques ranging from YSL, Celine, Zegna, Diane von Fürstenberg to Italian fashion doyens like Furla and Prada. Fahrenheit 88 Renamed and refurbished, opened in September 2010, the area previously housed the deteriorating KL Plaza. It consists of 300,000 square feet (28,000 m2) of lettable space spread over 5 levels of zoned shopping space. There is a designated zone for IT gadgets similar to that of Low Yat Plaza, named Signature@IT. This mall caters largely to homegrown, middle-priced retallers despite anchored by Japanese retailer Uniqlo. Lot 10 is as a middle-class retail destination as most outlets have shifted as a result of competition and degradation. Widespread refurbishment to the mall was done at a cost of RM20 million. Existing anchor Isetan has undergone a facelift. The entrance of this monumental landmark is flanked by British retailer Debenhams and Zara. Low Yat Plaza The ultimate one-stop center for KL-ites when shopping for electronic gadgets. The ratio between IT outlets and F&B outlets are 70:30. Sungei Wang Plaza (Chinese: 金河广场)— Despite being 36 years old, it remains a 100%-occupancy mall with the highest visiting traffic in Malaysia, though visitors more towards the younger crowd. It features mainly trendy Asian-inspired fast-retail fashion at bargain prices. BB Plaza (Chinese: 武吉免登购物中心)— Bukit Bintang Plaza is adjoined to Sungei Wang Plaza. It is anchored by homegrownMetrojaya. You can opt for street food at Jalan Alor as well as good restaurants (few are near Times Square mall). If you are a shopaholic then the best destination is The Times Square Mall. Its huge with loads of variety. In some stalls you can bargain too. Discounts run round the year with affordable prices. Beware for touts and agents on the road wanting to take you for a ride to some massage places. There is too much traffic in this area and best to take the monorail to get to this place. 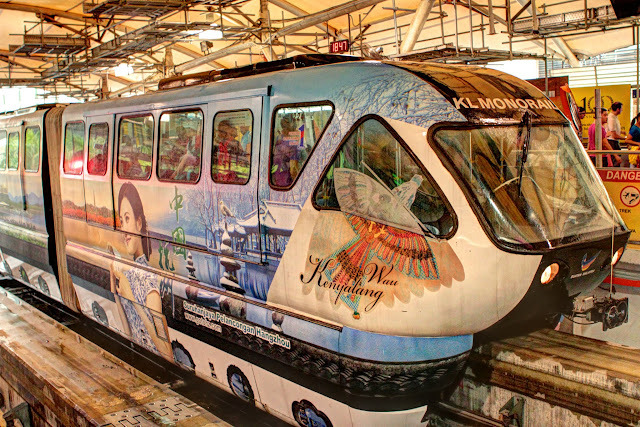 The monorail stations are situated here, you can stop at Imbi station or Bukit Bintang station. 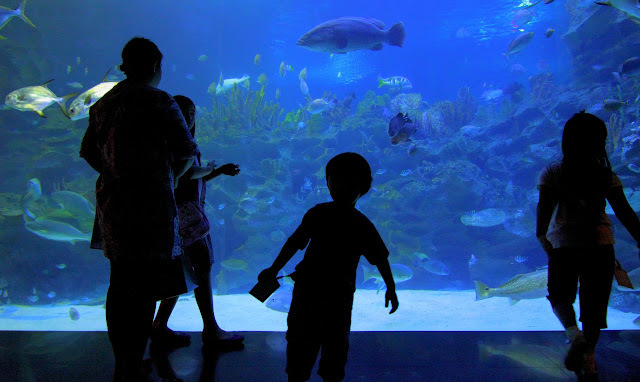 The Aquaria KLCC is an underwater park located beneath Kuala Lumpur Convention Centre within Kuala Lumpur City Centre. It is a must see for most kids when visiting Kuala Lumpur and can be easily combined with your visit to the KLCC Twin Towers. Featuring 60,000 square feet (5,600 m2) in two levels with a 90-metre (300 ft) underwater tunnel, Aquaria KLCC houses over 250 different species and over 20,000 land and aquatic animals from Malaysia and around the world. Interactive information kiosks on fish and turtle conservation. It includes a themed retail area of about 5,000 square feet (460 m2).